The Women’s World T20 starts on November 9, with England targeting their second major trophy in as many years. 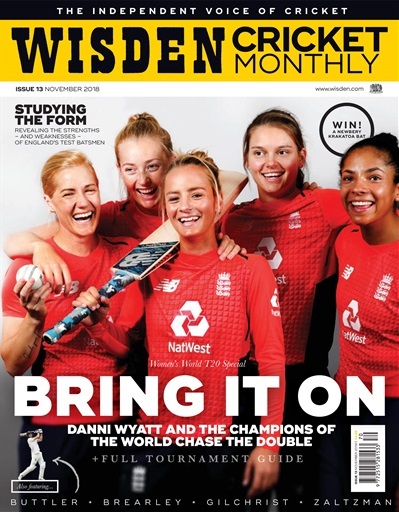 Our tournament preview includes in-depth interviews with Danni Wyatt and Nat Sciver, while Raf Nicholson looks back on the decade since England's 2009 T20 triumph. Elsewhere this month, CricViz's crack analysts examine the batting strengths and weaknesses of Joe Root’s Test side, Suresh Menon celebrates the rise and rise of Prithvi Shaw, and the incomparable Mike Brearley share his unique views on Virat Kohli.